One of the many indicators of our cooler than normal summer is that zucchini production is slower than usual. 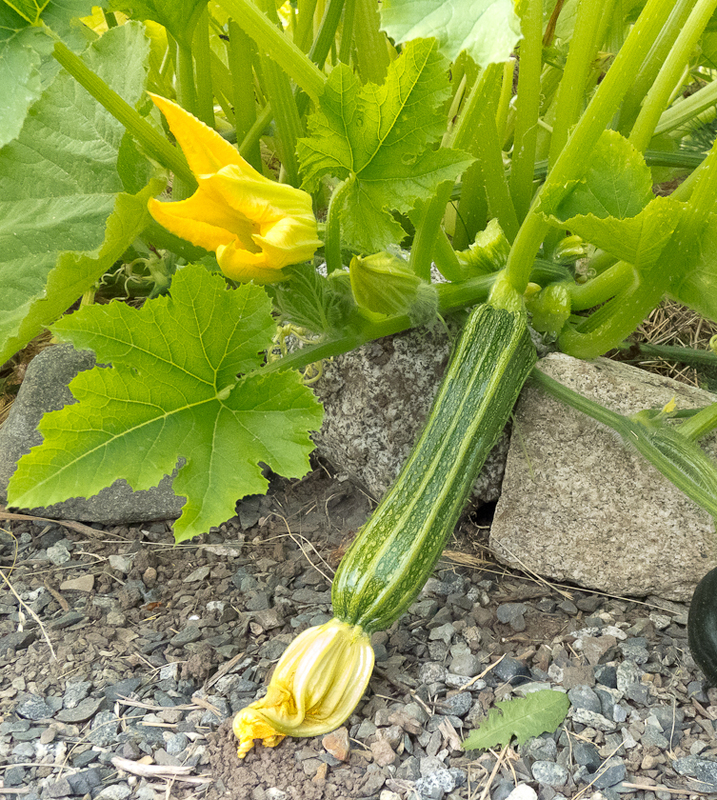 Instead of reaching club size overnight, this year’s zucchini stay on the vine for several days before becoming too big to eat. I wouldn’t mind this zucchini slow-down except that for the past few years I’ve grown Costata Romanesca, a variety I’ve really come to like. Before finding Costata, I’d grow a couple of zucchini plants each year, usually Raven or a similar smooth dark green zucchini, to fill the gap between the end of sugar snap peas and the start of green beans. After the green beans began producing, I’d pretty much ignore ripening zucchini or try to give them away. But then I read the Costata Romanesca description in the Fedco Catalog: “‘the only summer squash worth bothering with, unless you’re just thirsty.’ Deeply striped and ribbed, Costata resembles Cocozelle, with a distinctive sweet mildly nutty flavor.” It’s true. The flavor is great and the texture is firm enough to stand up to sautéing, grilling or roasting without dissolving. Now instead of ignoring them I look for new recipes that feature them. One I found last year is unusual, delicious and very easy, and I’ve returned to it more than any other this year too. Here’s the link to the full recipe from Food and Wine, August 2010: http://www.foodandwine.com/recipes/roasted-zucchini-with-ricotta-and-mint. 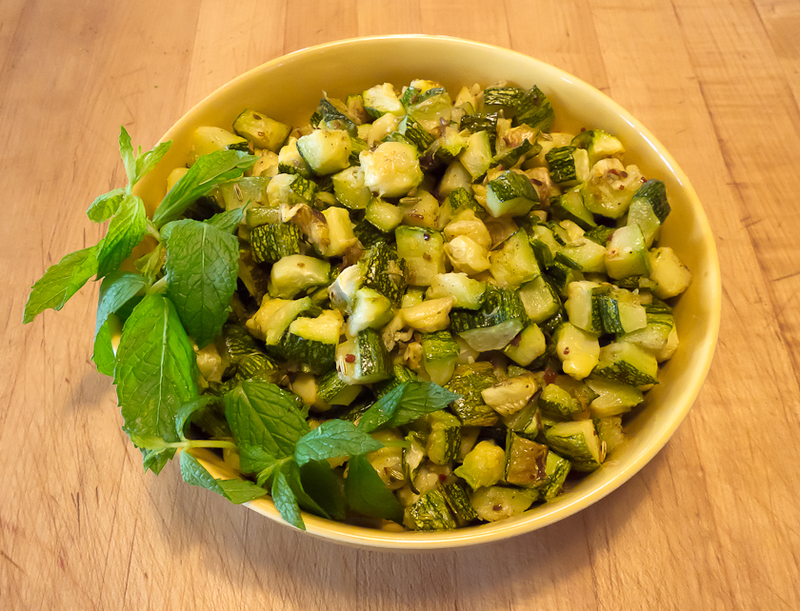 And here’s a summary: After cutting the zucchini into half-inch cubes, spread them on cookie sheets, brush them with olive oil, sprinkle with salt and pepper and roast them in a 450 oven for 18 minutes. Then take them out of the oven, sprinkle with red pepper flakes, cumin and fennel seeds and return them to the oven to roast for two or three more minutes. The fragrance of the toasted seeds is lovely. Serve as is as a side dish, use a pasta sauce or frittata filling, or turn into a salad with lemon juice, mint and feta cheese. A more complicated zucchini dish that our friend Nancy has been making every summer since 2005 when she saw the recipe in the Seattle P-I is Kabak Mucveri, Turkish-inspired patties made of grated zucchini and herbs held together with flour, egg and feta cheese and lightly fried. Here’s the link to the recipe: http://www.seattlepi.com/default/article/Good-Enough-To-Eat-This-dish-will-make-you-look-1182932.php They are wonderful on their own or in pita bread. And my favorite Costata Romanesca is particularly suited to grating. I’m sure other gardeners have their favorite zucchini. My sister Sarah’s is Clarimore. What is yours? This entry was posted in Summer Vegetables and tagged Costata Romanesca, Kabak Mucveri, Zucchini by Lopez Island Kitchen Gardens. Bookmark the permalink. I planted Costata Romanesca this year for the first time and am having a problem with it. The zucchini start out perfect and then rot at the flower end by the time they are 2 or 3 inches long. Is it the weather? Too much water? Not enough water? A neighbor says its because the flowers are not being pollinated. Do you have any ideas? Thanks for your comment. I have also experienced this condition, called zucchini blossom end rot, on my zucchini over the past few years. On my plants, it has happened to the first few zucchini that form. Later forming zucchini have been fine. With my zucchini, I suspect that the problem is pollination because once the temperatures warmed up a bit and more bees came around, the problem disappeared and hasn’t returned. If yours are still rotting at the blossom end, it may be calcium deficiency. Thank you for writing about MY favorite zucchini, too…most of all, for that recipe with roasted cubes. YUUUMMMM, I can’t wait to try that one. I’m just down the road from you and my plants are slow this year as well. I also had a problem with blossom end rot, but it’s remedied itself. Enjoying your blog, Debby, thanks for all of it! Thanks for writing! I’m glad you’re enjoying the blog. Hope your family likes the roasted zucchini. Thanks so much for all of your comments. I checked my plant yesterday and I have one zucchini with no rot. My garden is full of bees. That must have been the solution. I love learning something new. Hooray for bees! So glad to hear that you have a rot-free zucchini! If you like a few baseball bat sized Costata I could probably supply some. Actually they are so yummy I pick them constantly. Kevin grills them up with onions, clairmore, cocozelle & zephyr squashes for a sweet treat!